Ivory James' daughter Hr Ebony Princess, under jockey Ry Eikleberry, winning Saturday's Canterbury Park QH Derby. SHAKOPEE, MN�JULY 13, 2013�Royal Vista Ranches sires' IVORY JAMES and PYC PAINT YOUR WAGON helped Oklahoma-based trainer Stacy Charette-Hill continue her assault on Canterbury Park Saturday afternoon by siring the 1st and 3rd place finishers in the $27,050 Canterbury Park Derby. Charette-Hill also saddled the second place finisher. Stacy Charette-Hill is still puzzled and tickled pink every time she lands in the winner�s circle, which is nearly every time she saddles a horse. 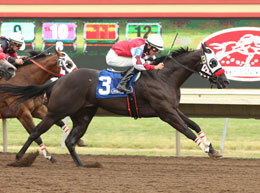 On July 5 Charette-Hill trainees finished 1-2-3 in the richest quarter horse race in the Minnesota track�s 27-season history, the $133,525 Mystic Lake Northlands Futurity. �This is unbelievable,�� said her husband, Randy Hill, upon entering the winner�s circle. Under jockey Ry Eikleberry, Hr Ebony Princess bounced off a second place effort in the June 29th trials to hold off stable-mate and fastest qualifier Hr Money Maker by a neck. The $27,050 winner's purse boosted her career total past $43,300. She completed the 400 yard course in :19.832 seconds, a 103 speed index. Bobby and Vickie Hammer of Elmore City, Oklahoma own the first two derby finishers. The winner had a touching story. �Her mother bled out giving her birth,�� said Bobby, �and she was raised by a cuttin� horse mare.�� �She was bigger than the mare,�� said Vickie. Hr Ebony Princess underwent surgery for a chipped knee and was laid up for more than five months. She has found her stride once again. The Hammer's bred both HR Ebony Princess and runner-up Hr Money Maker. HR Ebony Princess , a daughter of IVORY JAMES from the Thoroughbred mare Devilish Princess (TB), by Opposite, has a 2-3-0 record from nine starts. Hr Money Maker picked up $10,820 nearly double his earnings to $26,225. Jesse Torres was aboard. Michael Pohl's First Prize Wagon, also a Charette-Hill trainee, finished a neck off the leaders to earn $5,410. Jose Montoya rode the PYC PAINT YOUR WAGON gelding out of First Prize Kate, by Fly Jess Fly. Completing the derby field were Girls Dont Seis, Runaway For Corona, Patriots Dream 123, Hada Certain Charm, Outlaw Memories and Catchin Fire. The later finished fifth but was disqualified and placed last for interference. Tcf New Love was scratched.